French is spoken in France, but also in many different countries and continents. Of course, there are various French accents, with big differences, even accross France itself. French is widely spoken internationally: 29 countries list French as one of their official languages! More info about the way French is spoken internationally on wikipedia. Of course, all these people speak French. Real French. No French version is “better” nor “purer” than the other. It’s all French. But the French they speak may vary a bit, the same way English spoken England will vary from English spoken in Australia, or in the US. What is the Standard French Accent? The French accent varies inside France itself, between the different regions, periods of time, social class and also personal habits! 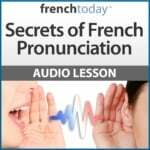 On French Today’s French blog articles with audio and in my audiobooks to learn French, you will find my own rendition of the French accent: an upper-middle class, middle-age, Parisian female accent. My accent is pretty standard, close to what has been chosen to represent “International French”. International French represents how educated francophone should speak…. I know, it’s not very PC! You’ll find more info about standard French on wikipedia. Although the language structure is the same, vocabulary and mostly French pronunciation vary tremendously worldwide. I thought it would be interesting to hear the other French accents. Unfortunately, I don’t have the personal connections to record many different accents – and I’m terrible at mimicking accents myself! So I searched the web far and wide, and this is the best I could find. Enjoy! (You may have to wait a bit for the ad to go by first… Or press a button to skip the ad). Turn the CC for subtitles… but they are auto-generated so there are a lot of mistakes!! This is a comedian who mimics the different French accents you’d find through Africa. I was told she did a good job.